Two students from Middlesex University's BA Graphic Design course have received accolades in the 2015 Creative Conscience Awards. Second year students Sylvia Wydra and Fatma Al Mansoury were both recognised in the annual Creative Conscience design competition, which invites the next generation of designers to create human-centred designs that aspire to make the world a better place. 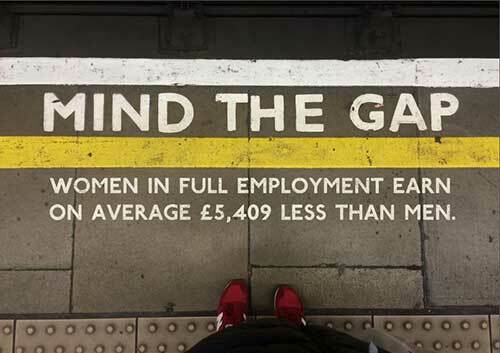 Sylvia won gold for Mind the Gap, a graphic design guerrilla campaign aimed at raising awareness of the disparity between men's and women's wages. 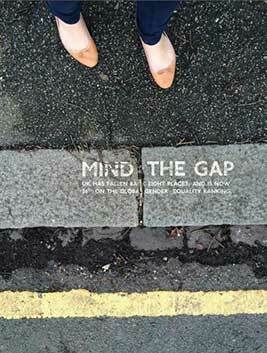 Sylvia's project plays on the words Mind the Gap, commonly used as a warning on train station platforms, which she superimposed onto gaps between buildings and cracks in the urban environment. Alongside, she placed statistics highlighting the difference in pay between men and women. Entrants to the Creative Conscience Awards are invited to devise their own brief for their submission, and in developing her campaign Sylvia was inspired by the recent He For She gender equality campaign fronted by actress Emma Watson. "Figures show the gap between men's and women's earnings is at its closest since records began, so we're going in the right direction. But men still earn 17.5 per cent more than women on average per hour, meaning women earn 82p for every £1 earned by a man," Sylvia said. "It seems ludicrous that gender inequality still exists at all since, in theory, it is illegal. We don't deserve being thought of as less worthy of a decent salary just because we're women." 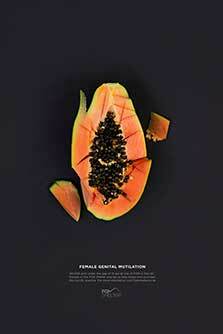 Fatma's project, which was awarded silver, aims to promote the prevention of female genital mutilation through a series of bold advertisements where images of a split cantaloupe and a cut papaya represent the practice. "Since it's a grotesque practice and a sensitive topic, I feel like people are too afraid or uncomfortable to get involved," said Fatma. "My way of raising awareness about the cause was through communicating it with fruit – a light way for the viewer to take in the message. By photographing a less invasive but compelling metaphor, the campaign shocks the viewer into realising the terror young girls are subjected to." The news of her award came as a shock for Swedish-born Fatma. "I was a bit shaky and overwhelmed after finding out my work was awarded silver," she said. "I felt stunned being told that I, as a designer, have the power to get people involved in this heavy topic." Sylvia, originally from Poland, was also honoured for her work to be recognised in this way. "What I like about Creative Conscience is that it's entirely not-for-profit and all of the people involved work pro-bono, yet it's glamorous and rewarding, especially as the competition is about ideas changing the world for the better."